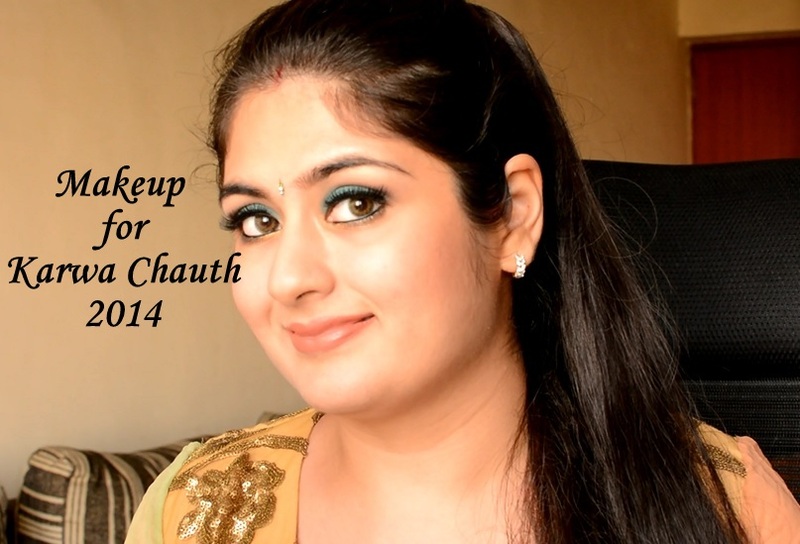 Karwa Chauth is a celebration every married woman looks forward to. 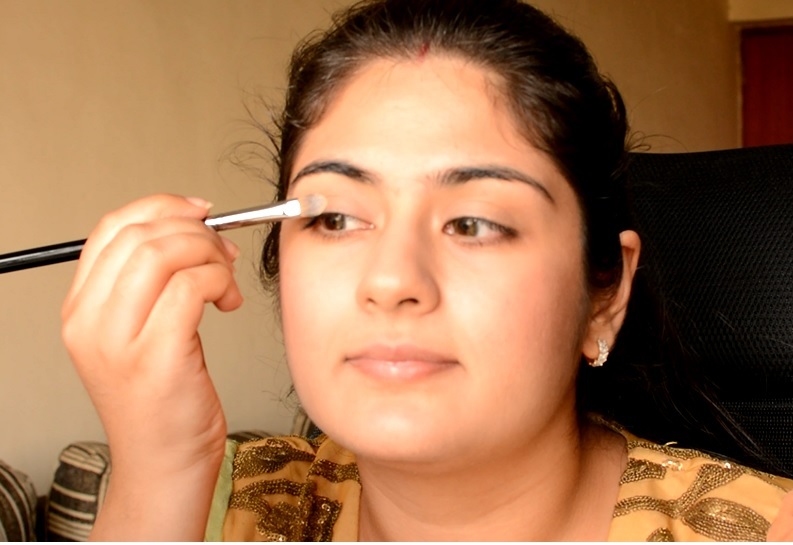 Applying gorgeous mehndi, choosing an anarkali, lehenga or saree for this auspicious occasion brings back memories of the day a woman gets married. 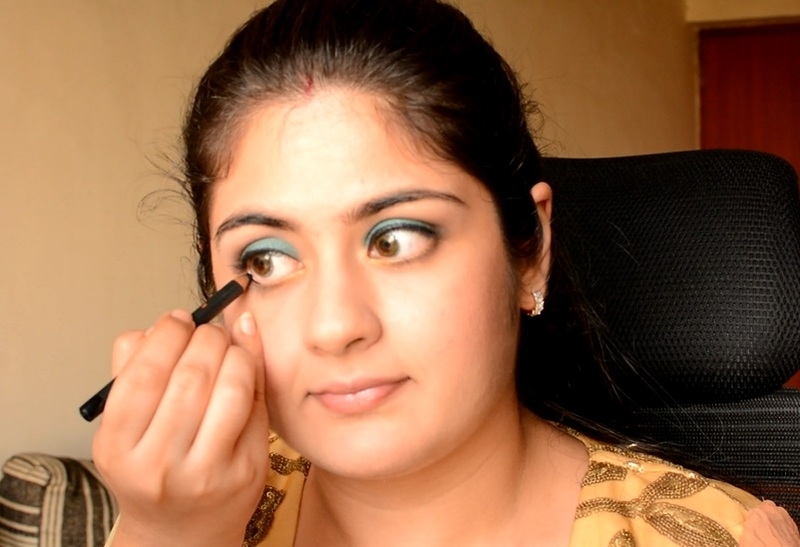 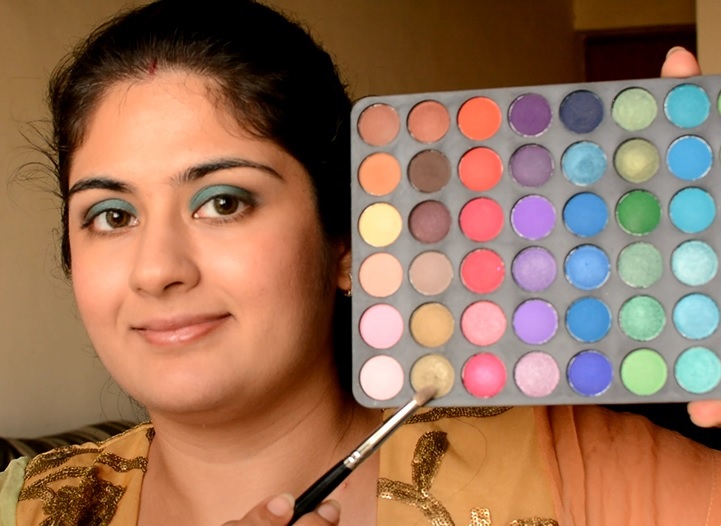 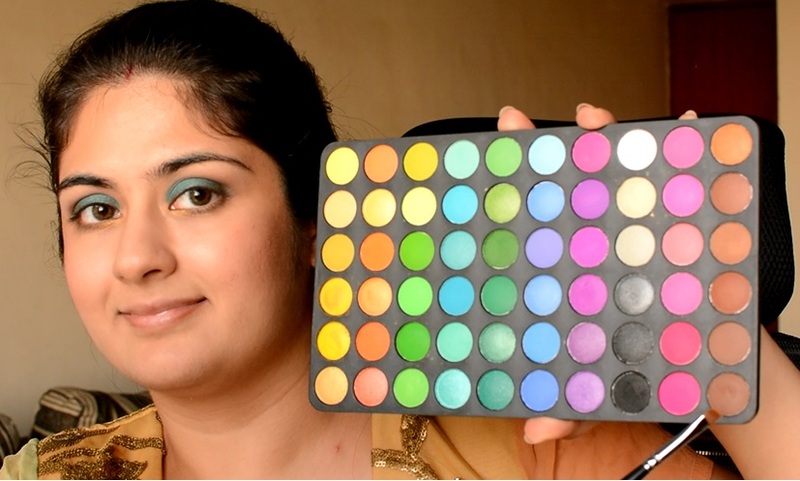 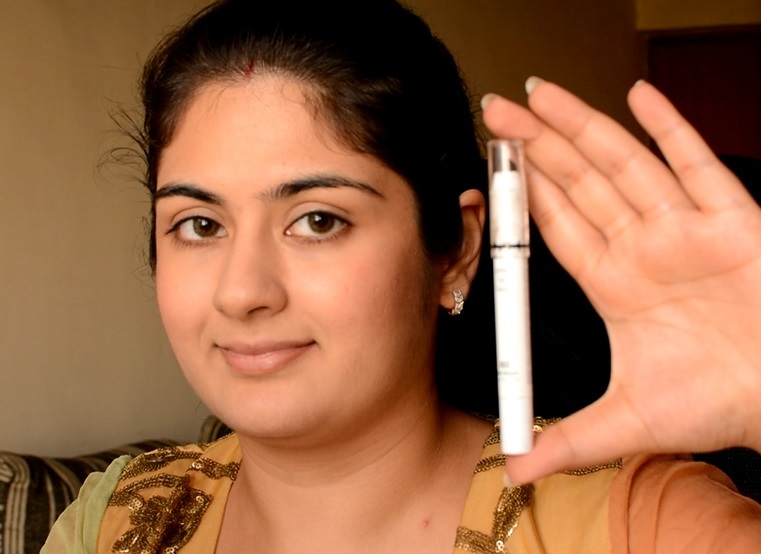 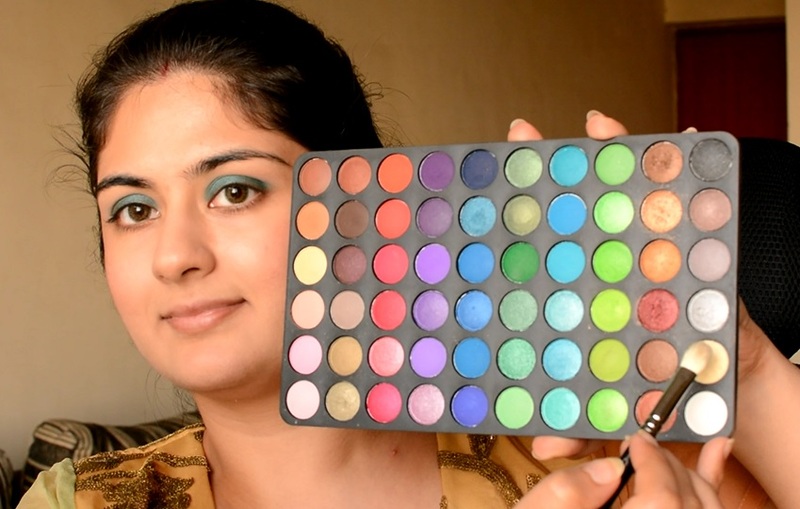 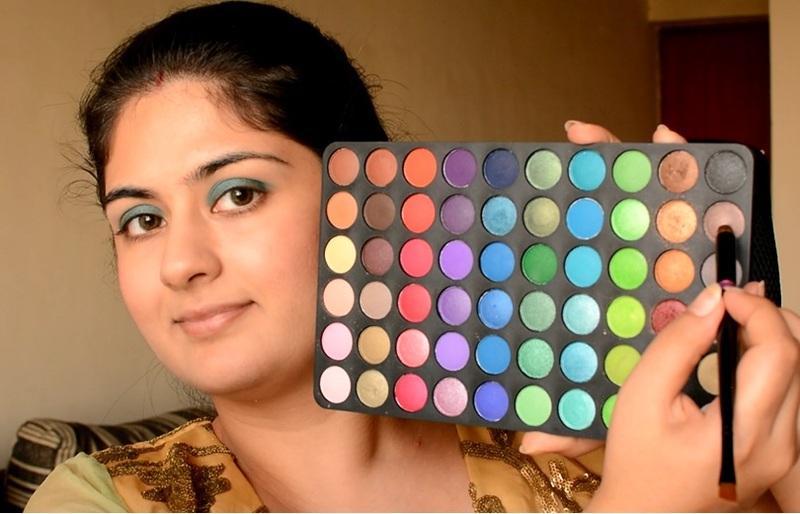 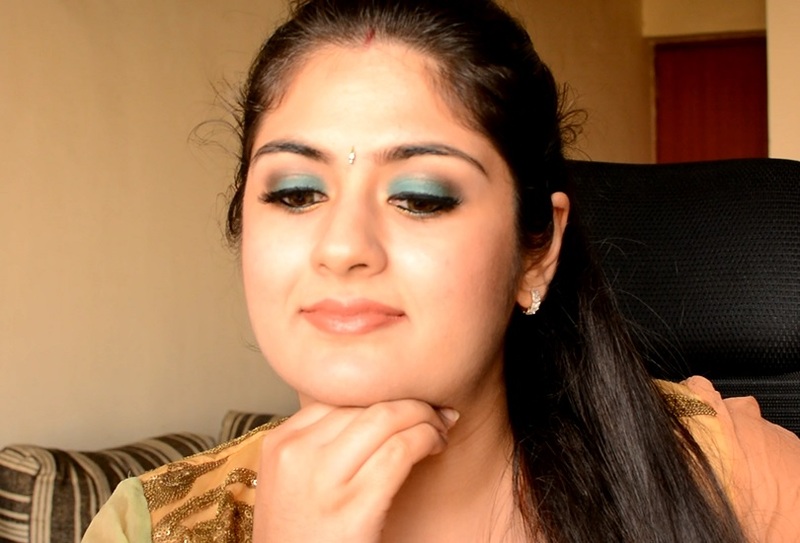 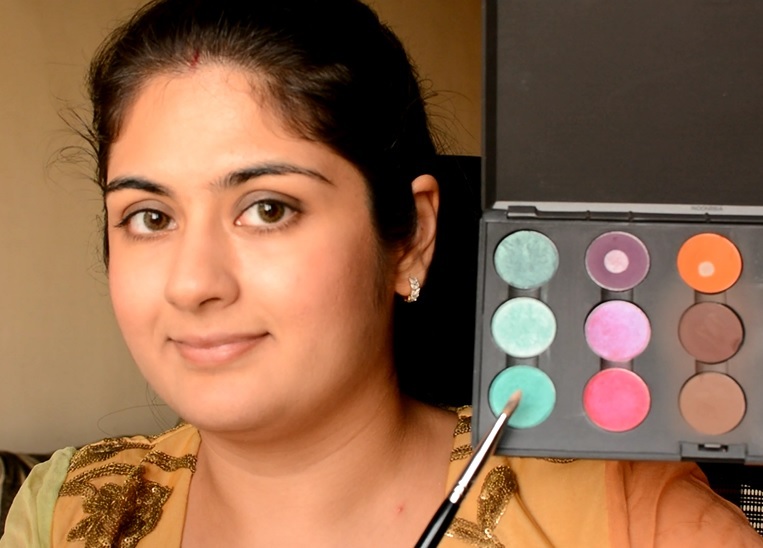 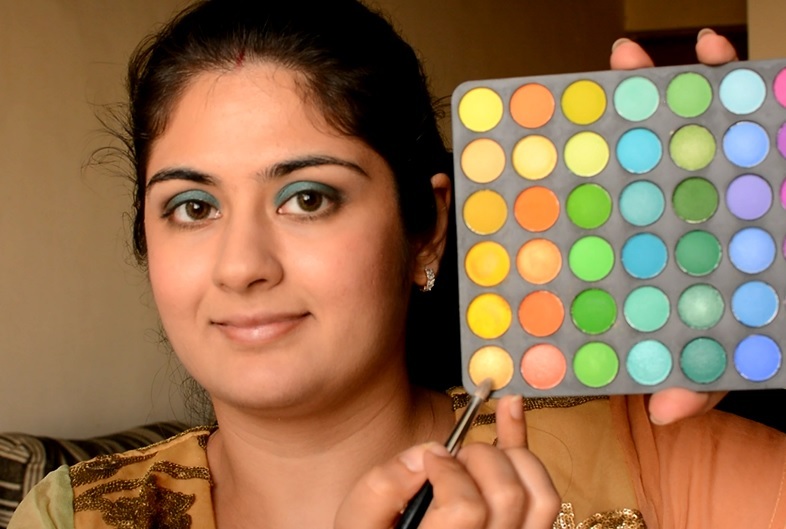 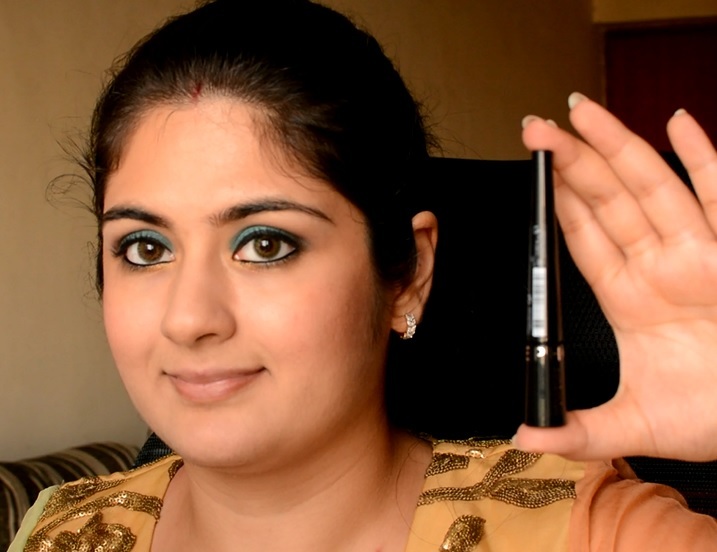 So here is a gorgeous eye makeup tutorial on how to apply makeup for Karwa Chauth 2014. 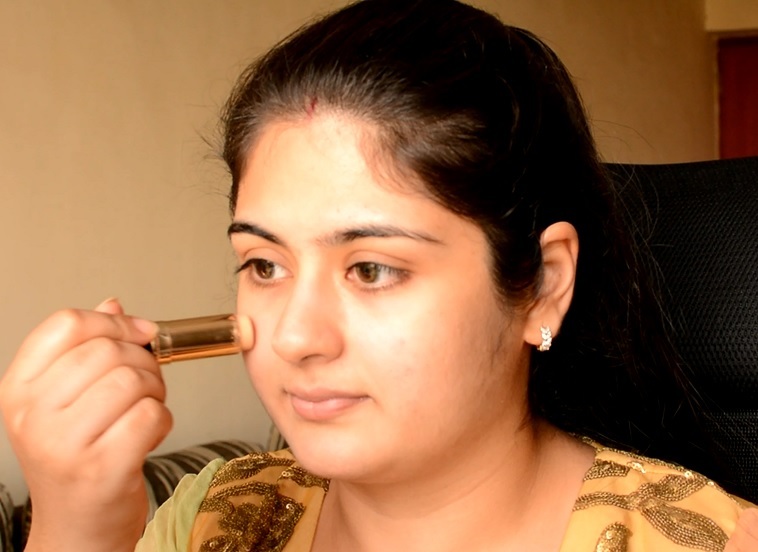 Step 1: I started by applying the Bobbi Brown stick foundation all over the face and spread it evenly with a sponge. 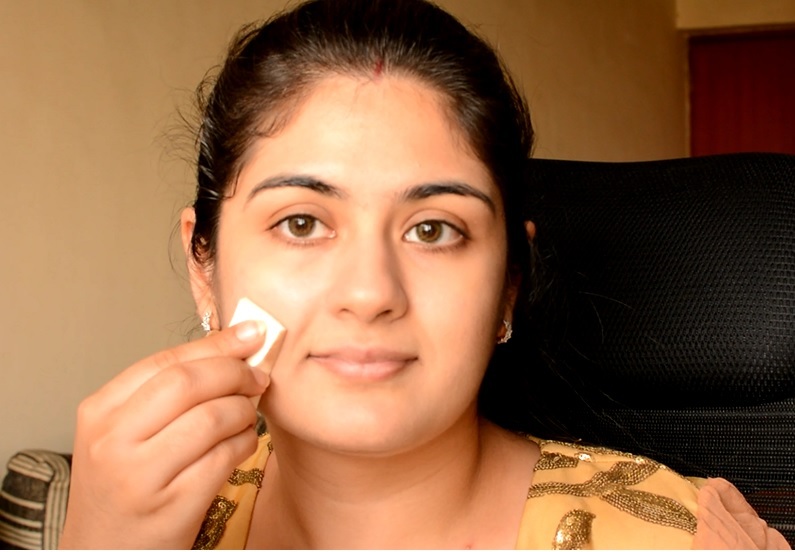 I did not dampen the sponge as the texture of this foundation is very creamy and spreads really well with a dry sponge. 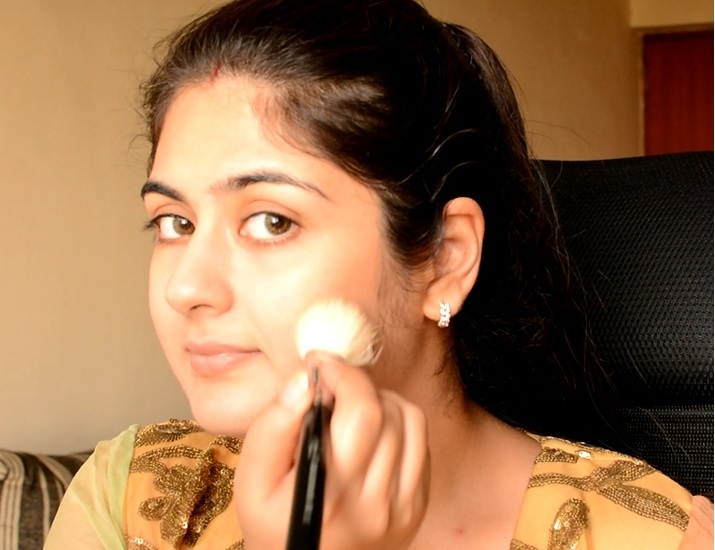 Step 2: To contour my face, I used Benefit’s Hoola with a Sigma Angled contour brush and applied it over the hollows of my cheeks and a wee bit on the chin area. 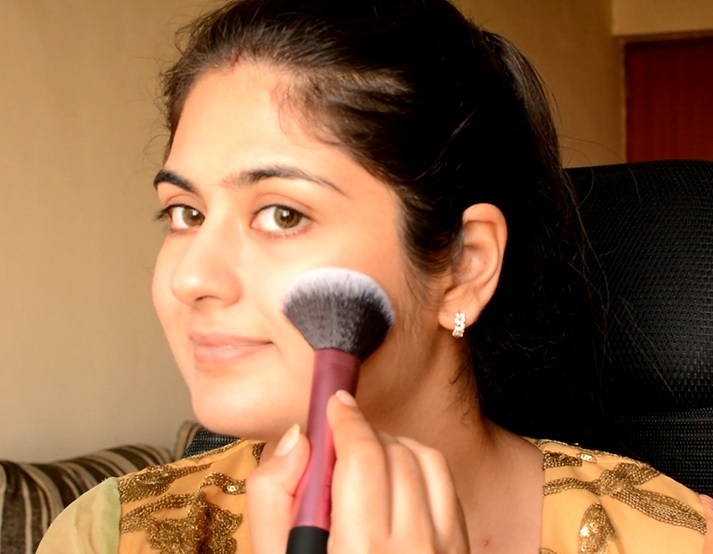 Step 3: To add a hint of color to the cheeks I used B&D blush in a peach shade and swept it upwards on the cheeks with the Real Techniques blush brush. 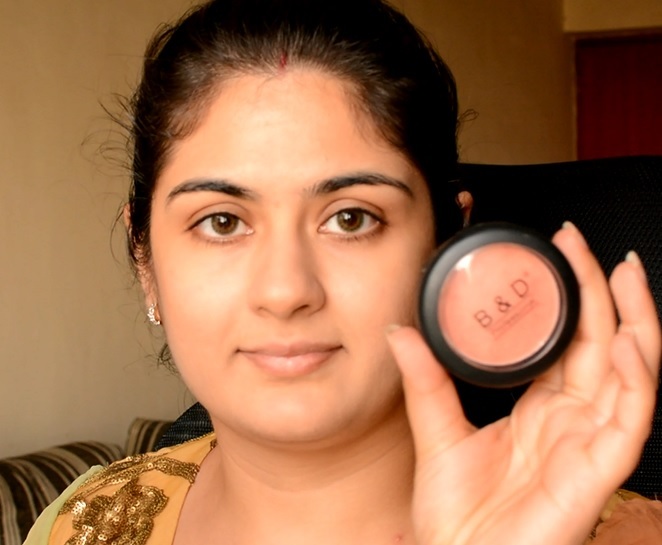 This blush has a slight golden sheen to it, hence I did not apply a highlighter separately. 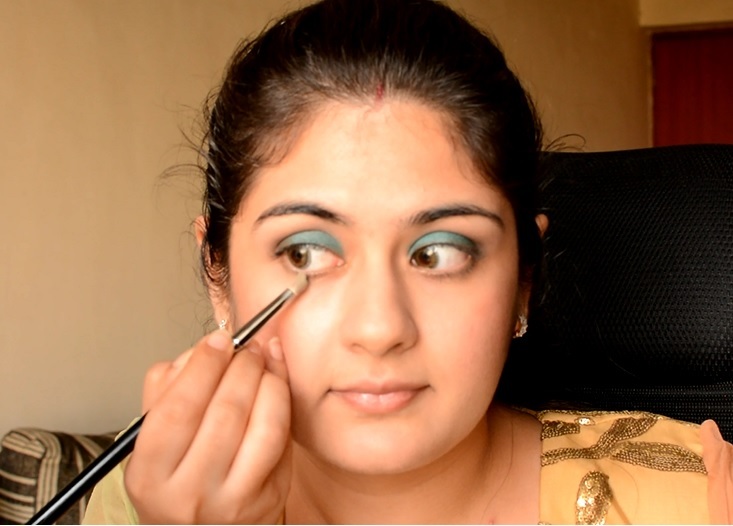 Step 4: Now for the eyes, I first applied an eye primer – Benefit’s Stay Don’t Stray with a Sigma flat shader brush all over the eyelids. 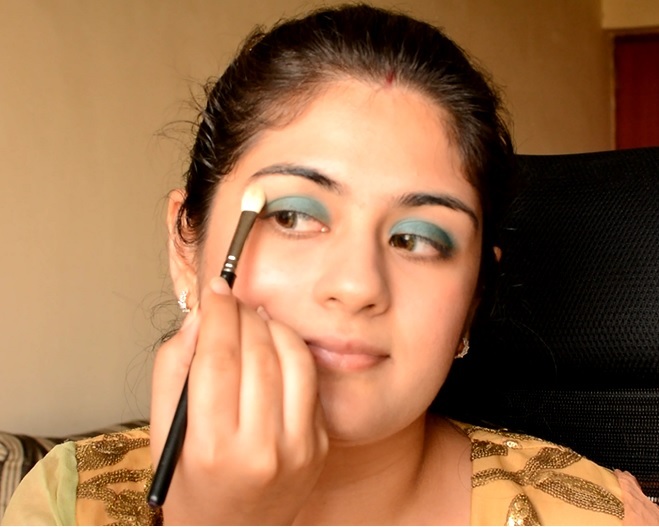 Step 5: Next, I used the NYX Jumbo pencil in Dark brown as a base for my next eye shadow and smudged it with Sigma’s pencil brush. 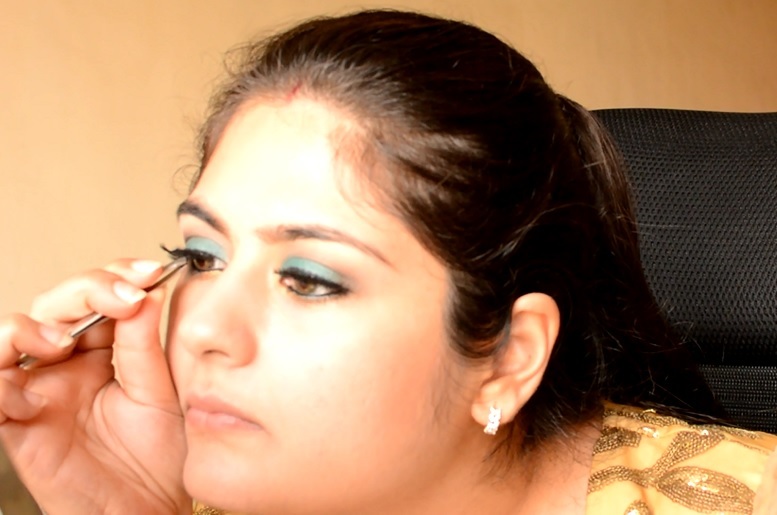 I smudged some on the lower lash line too. 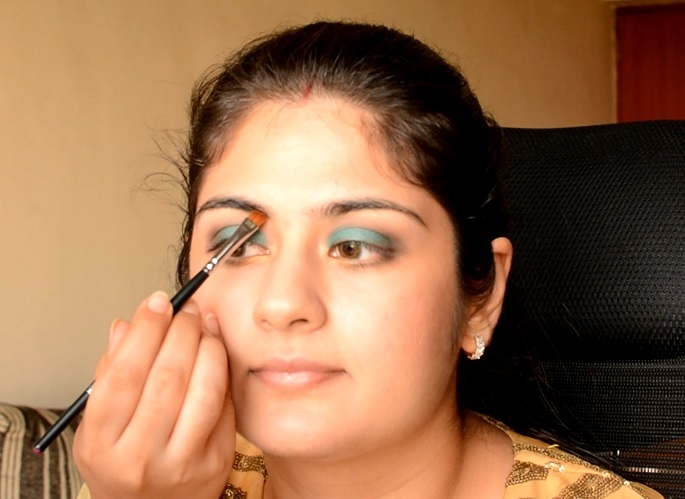 Step 6: Complementary colors look lovely on the eyes. 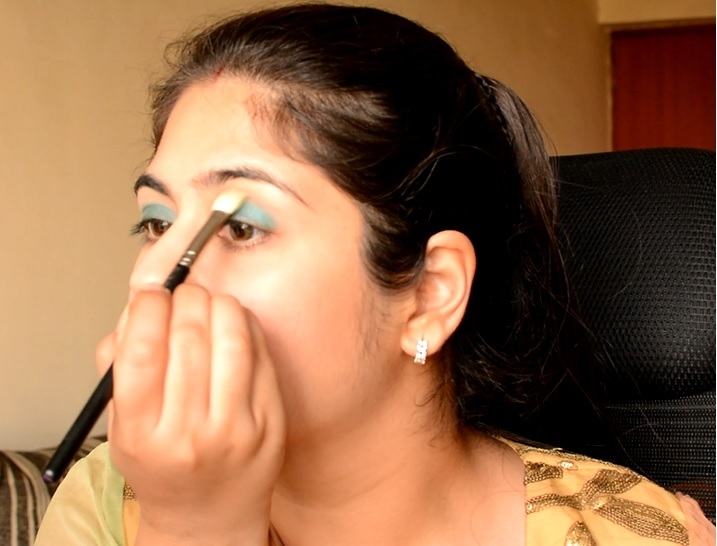 Hence on my orange outfit, I chose a turquoise/sea green eye shadow, Surf USA by MAC (Limited Edition) and applied it all over the lid, below the crease line with a Sigma flat shader brush. 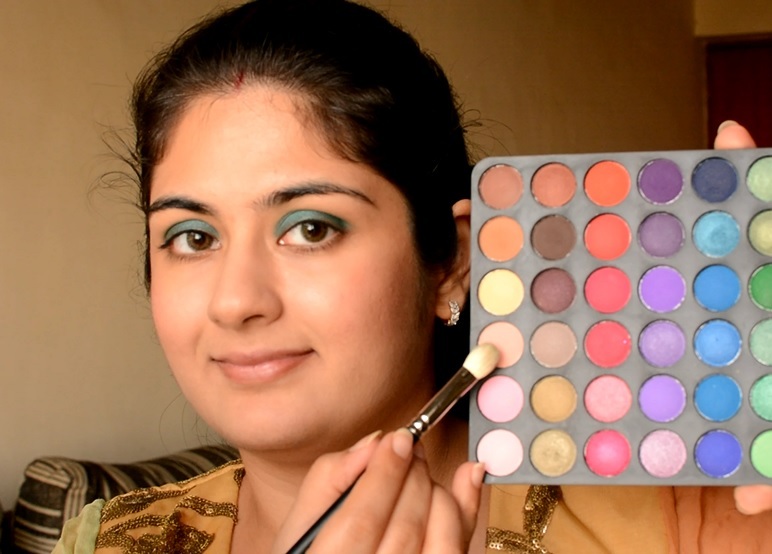 Step 7: As a transition color, and to help blend the blue shade better, I used a light pink color from the BH Cosmetics 2nd Edition palette with the MAC #217 blending brush. 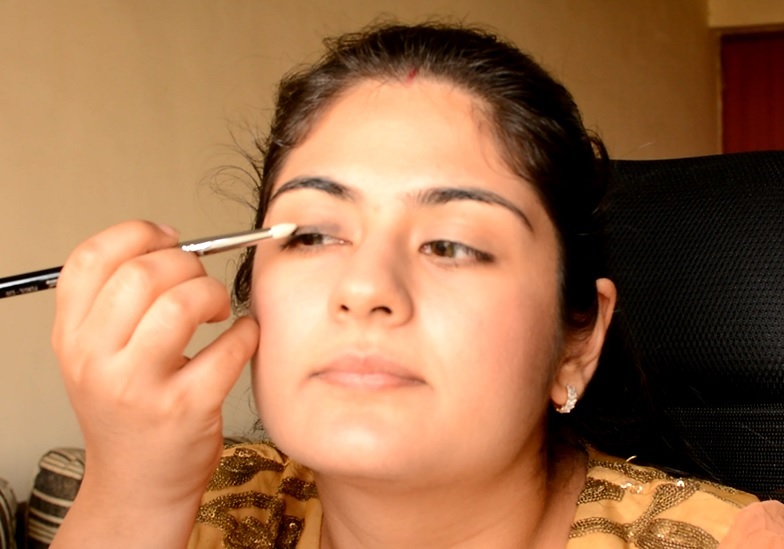 Step 8: As a highlighter, I used a shimmery gold color shadow to apply on the brow bone. 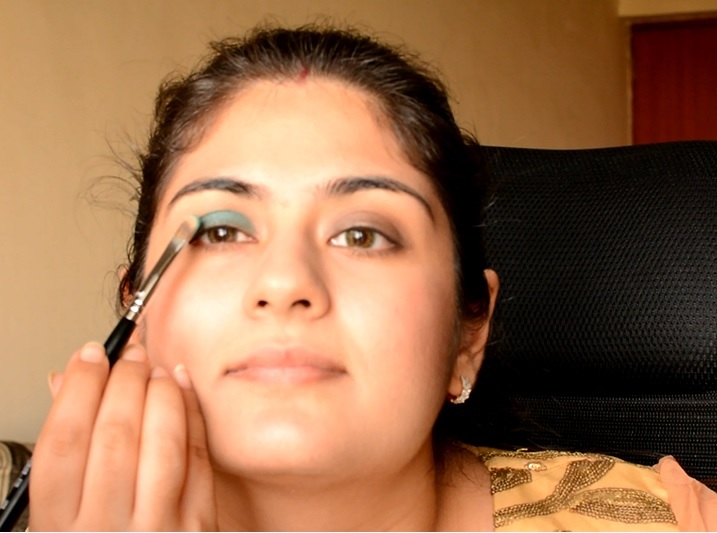 Step 9: To intensify the crease, I applied a bronze eye shadow with an H&M crease brush into the socket line and blended it very well. 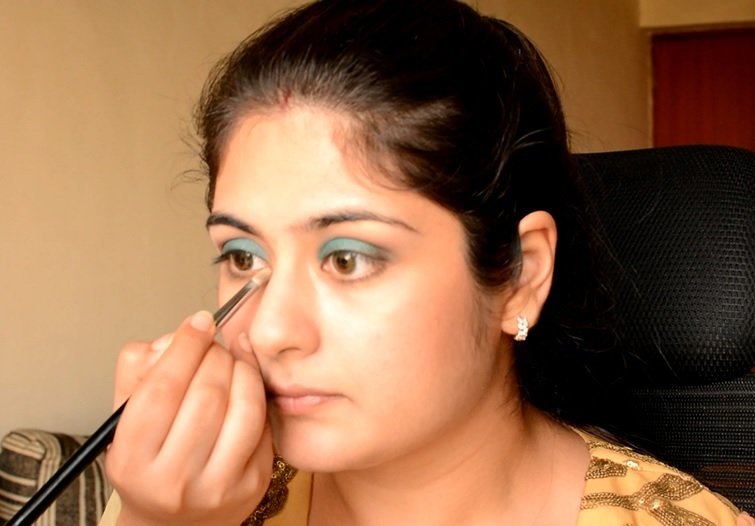 Step 10: Below the waterline, I applied an olive shade with a Sigma pencil brush. 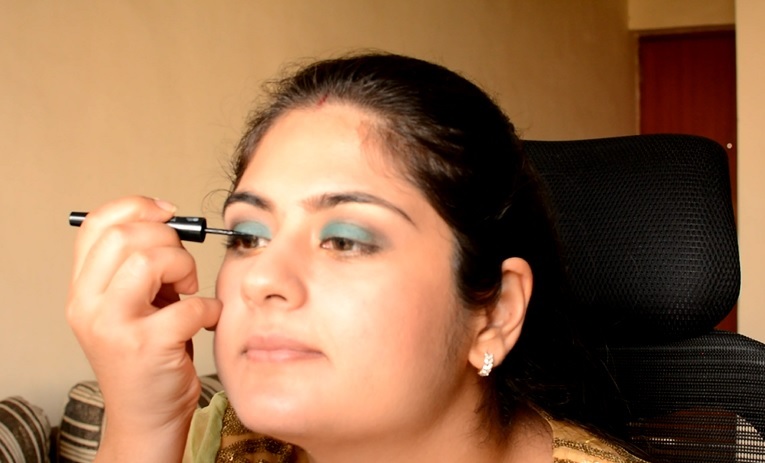 Step 11: And to highlight the tear duct area, I used a gold shadow just in the inner corners of the eye. 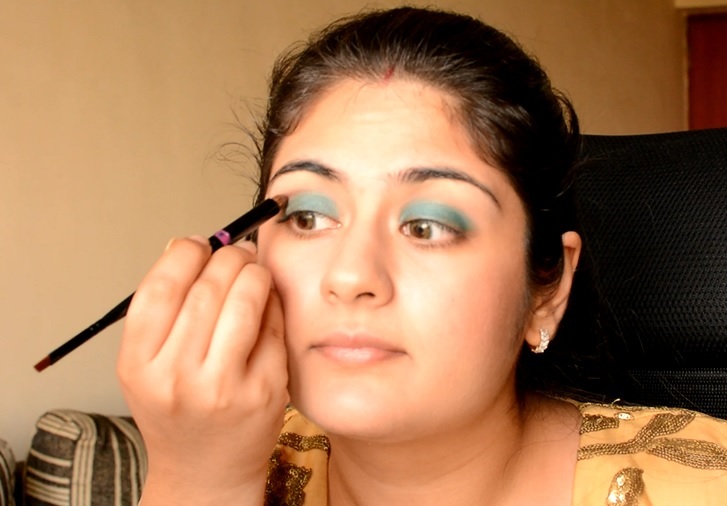 Step 12: To add some structure to the face, I filled in my eye brows with a matte brown shadow and a Vega angled brush. 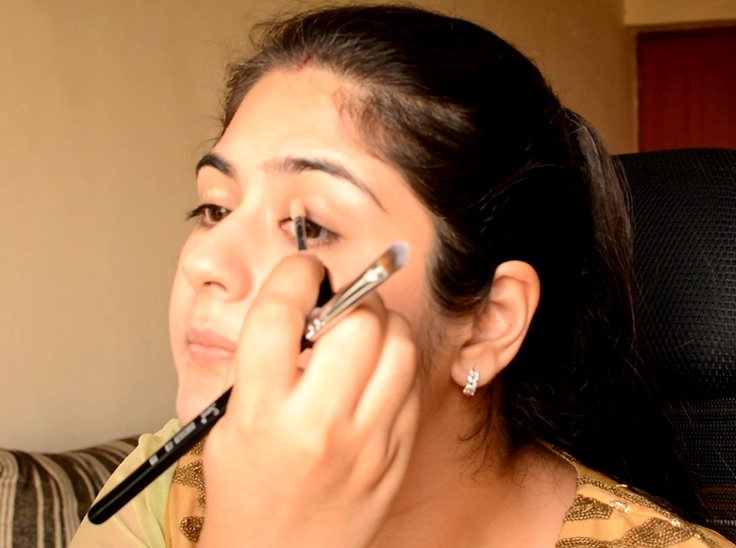 Step 13: MAC Smolder was used as a kajal to line the waterline. 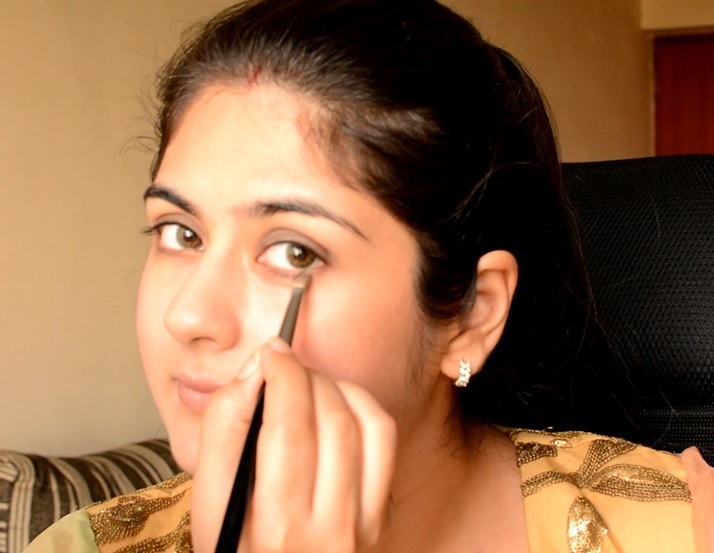 Step 14: To help draw a basic eyeliner, I used the liquid liner by Sephora. 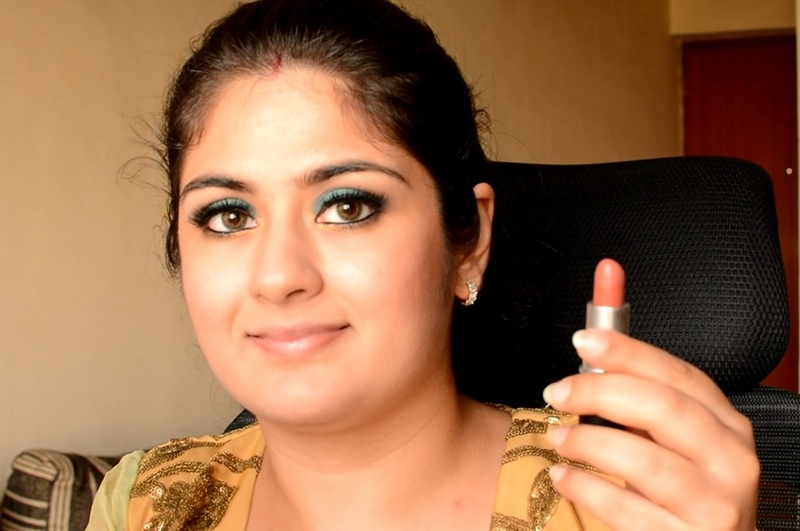 Step 16: As the last step, I used MAC Mocha lipstick to go with the color of the outfit I was wearing. 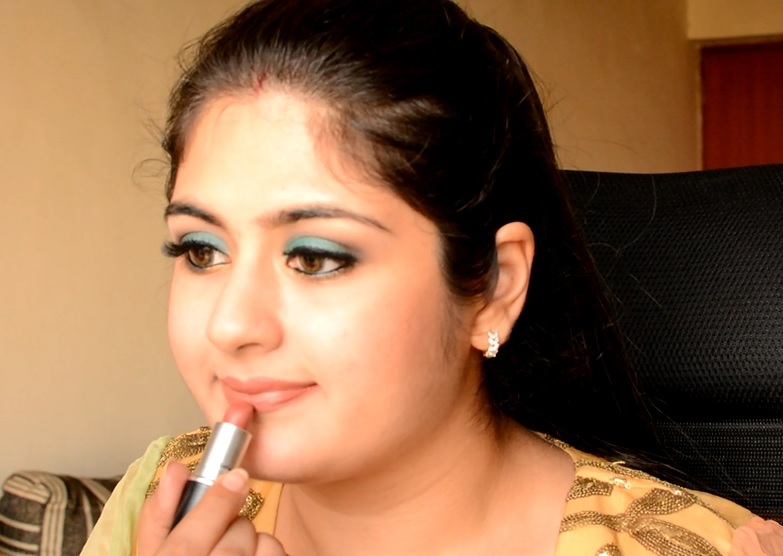 Do comment below and let me know if you liked this look. 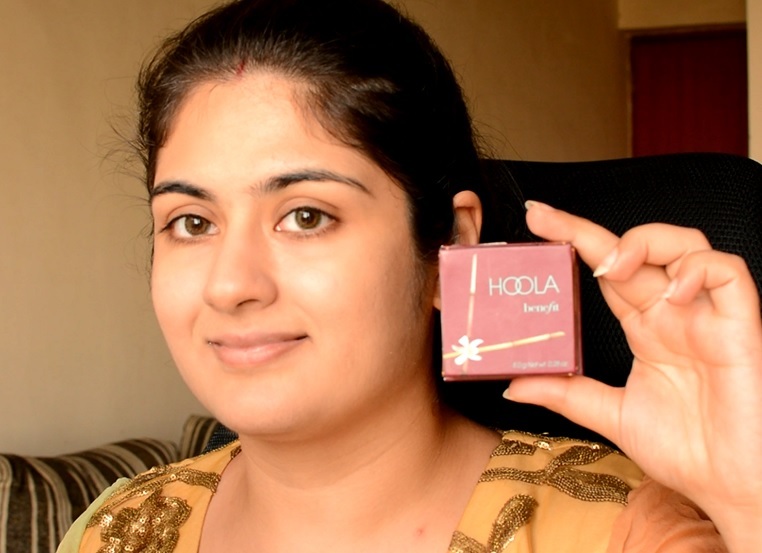 Good luck & Happy Karwa Chauth.